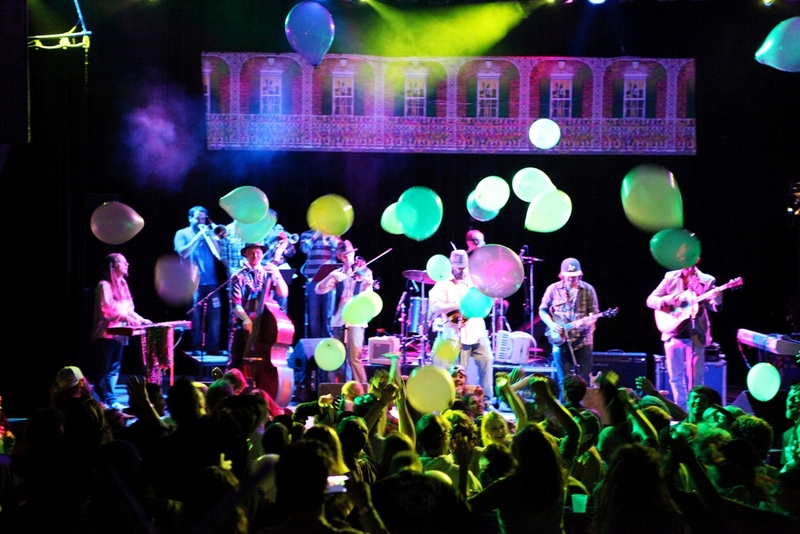 The night is young around midnight; the music loud, beads and balloons reflect the Mardi Gras aura at Fox Theatre with WhiteWater Ramble. The show, much like their music, is unpredictable to say the least. The evening consists of staple WhiteWater tunes, a few Mardi Gras classics, an always-packed stage of welcome accompaniments, and a crowd as wild as the performers. A collage of sounds takes shape as a result of numerous influences that yields, what WWR describes best as their, “High-Octane Rocky Mountain DanceGrass” style.This self-description can’t do justice to the unpredictable fashion of music that leaves listeners adventuring down the rabbit hole of WWR’s unique sound, losing themselves in a wonderland of melody. As if the music isn’t enough, viewers still get the pleasure of witnessing and participating in a show best summarized as a celebration, a party everyone is invited to.Movement is the language, and WWR is the subject of conversation. Their erratic wanderings guide unknown expectations, making every groove a new river to ramble, a peak to experience, a height to bob in. With each song the night advances further into a rowdy jamboree fueled by the multi-dimensional bluegrass medley, in a manner that does New Orleans proud. Mardi Gras is traditionally a carnival beginning on or after an epiphany; meaning uproars of smiles, good times and dancing after a striking occurrence of understanding; enlightenment which takes shape in losing all sense of bearing having been blindsided by the progressive and unorthodox sound WWR so generously provides. From a bouncy bluegrass feel with highlights reaching into rock, funk and hints of blues, the music forces listeners to follow its drifting cadence. The performance captures that carefree and raucous Mardi Gras lifestyle with limitless instrumentation of real time musical pioneering.WWR engages a larger genre that can’t fit inside the lines. With loads of range to entertain the most diverse collections of fondness, the music embraces that which is undefined. From dueling solos to collaborative jamgrass freestyles, the funk infects each moment.The night’s bill is far from shy, welcoming accompaniments by The Brass Tax, Jet Edison’s Phil Johnson, Joel Lessard of Head for the Hills, Joey Porter of The Motet and Juno What? 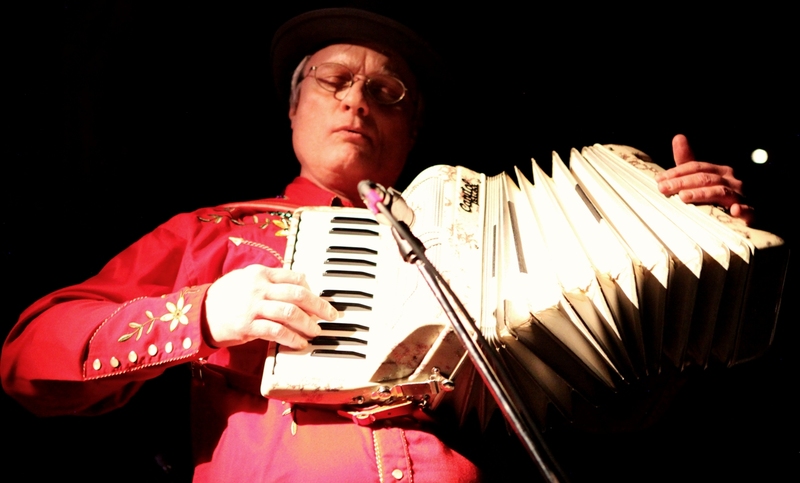 !, and even including WWR’s own Howard Montgomery’s father Bob Montgomery on the accordion. WWR’s all-inclusive untamed sing-along enables aimless discovery of whatever comes next, be it a funked-up bluegrass bass line or a jamgrass core with drums to up the ante and splash some extra style in the pot. There was no room to resist the urge of joining along in the out of control ramblings of a musical plethora, where each seamlessly strung together sound tickles the ear encouraging your feet to move. In doing justice to the unruly nature of Mardi Gras, a volatile style of music, and a crowd happy to partake in the festivities, WWR raises the bar of live performance. With a surplus of smiles, dancing, and bead-tossing good times the Fort Collins native posse delivered a show to remember.Check out more photos from the show.